Several members of the U.S. women’s national soccer team including standout stars, Hope Solo, Alex Morgan, and Carli Lloyd, have filed a wage-discrimination claim against the U.S. Soccer Federation with the Equal Employment Opportunity Commission. Although the women’s soccer team generate millions more in revenue than the men’s team and are a powerhouse in the soccer world, they make significantly less than what the men earn. To put the difference in pay in perspective, if the women’s team wins a game the players earn $1,300 while if the men win, they earn $17,000. If the men’s team loses, they still earn more at $5,000 while the women don’t earn a penny for a loss. The women’s team are also calling for better field conditions, per diem, and equal travel accommodations as the men’s team. This move couldn’t come at a better time for the women’s soccer team as we are approaching the 2016 Olympics. The players are strategically striking while the iron is hot and capitalizing on the popularity of the Olympics, showing they clearly understand their value to the games. The players aren’t the only women of influence calling for wage equality. An increasing number of women in Hollywood have been using their influence to shed a light on wage inequality. Stars such as Robin Wright and Jennifer Lawrence have recently spoken out about their experiences with the wage gap. Equal pay has also been a top issue for some of our presidential hopefuls. All of this buzz around equal pay has been sparking debate and starting the conversation on a wider scale. According the most recent data by the U.S. Census Bureau, women who worked full time earned only 78 cents for every dollar men earned. These figures change drastically for women of color. African American women earned 64 cents and Latinas 56 cents for each dollar earned by a white male. Women also make up over half of the workers making minimum wage or less. These wage disparities remain even with the Equal Pay Act in 1963, the Lily Ledbetter Fair Pay Act of 2009, and other legislation prohibiting employment discrimination. Recently the AFL-CIO conducted the National Survey of Working Women in an effort to get a better understanding of the experiences and aims of working women. Nearly 25,000 working women responded to the survey. Largely, the survey showed that equal pay for equal work was the biggest motivating issue for working women. The survey also showed that women are primarily the financial decision makers and breadwinners of their households (nearly 60%) which is why now more than ever, fair pay for women is crucial to the entire family. 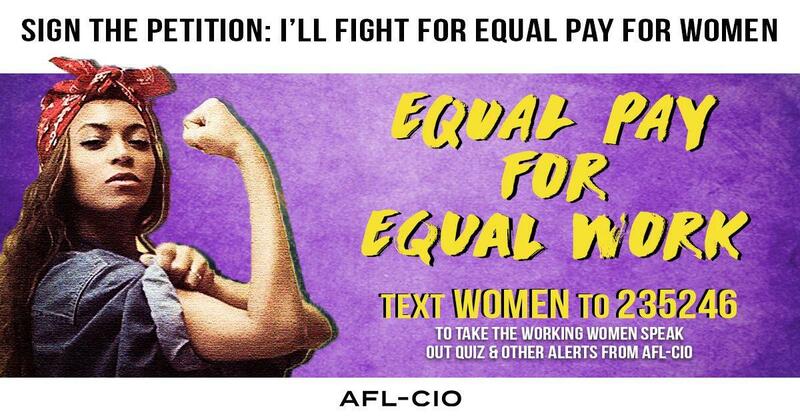 Although the women who stated they were members of a union reported making better wages and benefits than the non-union survey responders, women of all ages and demographic groups reported that equal pay would be the change that would most improve their lives. The conversation on wage equality has never been more wide spread. With the presidential election looming, it’s more important than ever to educate yourself on the issue and how your voice can be the change we need. The time for equality is now. Find out where you stand in your workplace and how to make yourself an equal among your colleagues, like in the video below. Understanding your value as a worker, whether you’re an entry level employee, an executive, or a star of the US women’s soccer team, is the first step in tipping the scales towards wage equality. You can start now by signing your name to this petition and making your voice heard at the ballot box this November.